Aluminium — element No. 13 of the table of Mendeleev, where indicated by the symbol Al (from the Latin Aluminium). It is a widespread element in the earth’s crust. In its pure form is a light paramagnetic metal white-silver color available moulding, machining. You’ll be a great heat and electrical conductivity and resistance to corrosion thanks to the durable oxide film that protects the surface. Metal white-silver color, very light, its density is 2.7 g/cm3. Refers to small paramagnetic materials the Specific heat of fusion is 390 kJ/kg Technical aluminum melts at t° 658 °C, and high purity aluminium — at 660 °C. the aluminium Boils at a temperature of 2500 °C. the Specific heat of evaporation of 10.53 MJ/kg. a Temporary fracture resistance clean broom is less than 12 kg/mm2, and the alloy can exceed 40 kg/mm2. Brinell hardness number of about 30 kgf/mm2. The ductility of commercial aluminum 35%, net Al — 50%, young’s Modulus is 70 GPA. The resistivity of 0,037, Mhmm2/m 66% of the conductivity of copper. 203,5 thermal conductivity W/(MHC)), Aluminium forms alloys with all known metals. Most useful alloys with copper, magnesium, silicon. 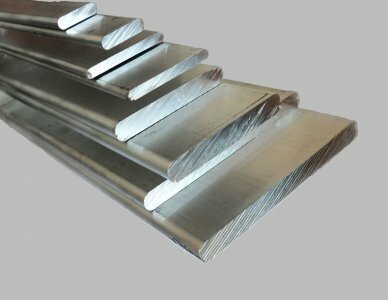 The main disadvantage of aluminium is a small strength, but this disadvantage is overcome in the alloy with copper, magnesium or other metals. Pure aluminum is a fairly reactive metal, but under normal conditions its surface is covered with oxide film, which prevents its interaction with oxidants such as O2, H2 O, NGO3. It is resistant to atmospheric and soil corrosion and are therefore relevant for plating. But when breaks the surface oxide film, the aluminum becomes an active reducing agent. It is a good structural material — lightweight, corrosion resistant. It is easily punched, drilled, cut, has a higher thermal conductivity, non-toxic. Aluminum produce kitchen appliances, a special foil not only for the food industry and for insulation. The popularity of this metal due to high consumer quality and more than reasonable price. Until recently, it was uncontested material for the aviation industry. Today it is from this sector began to displace such material as carbon fiber. Supplied certified aluminum Bicycle any parameters. In the technical documentation included data on the percentage composition and performance products. We can easily buy in bulk any semi-finished products for large-scale production. We also work with retail buyers. A high level of service and speed of service are the face of our company. In stock company «Elektrovek-steel» always in the presence of aluminum rolled at a reasonable price. It is based bets on European non-ferrous metals without incorporating extra cost. Supply certified products of domestic and foreign manufacturers. Cooperation with us gives a number of advantages. Our experts will be happy to provide advice in the purchase of any of the alloys, the correct choice of which will depend on the performance and durability of equipment. We will help to determine not only the optimal parameters of the product, but also offer the best price.